Rubber Ring Secures PVA Bag to the Actual Weight. Grip on the PVA Bag is So Strong that Casts in Excess of 150yds are Possible. Rubber Ring Secures PVA Bag to the Actual Weight. Grip on the PVA Bag is So Strong that Casts in Excess of 150yds are Possible. 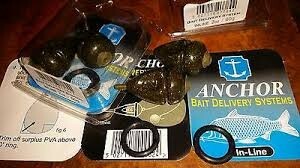 FREE Delivery on all Reel Fishing Carp Leads over £100!! !